You are a 4G LTE or other mobile network service provider with over 100,000 subscribers and would like to offer IPTV or OTT services to drive sales to existing and future customers. 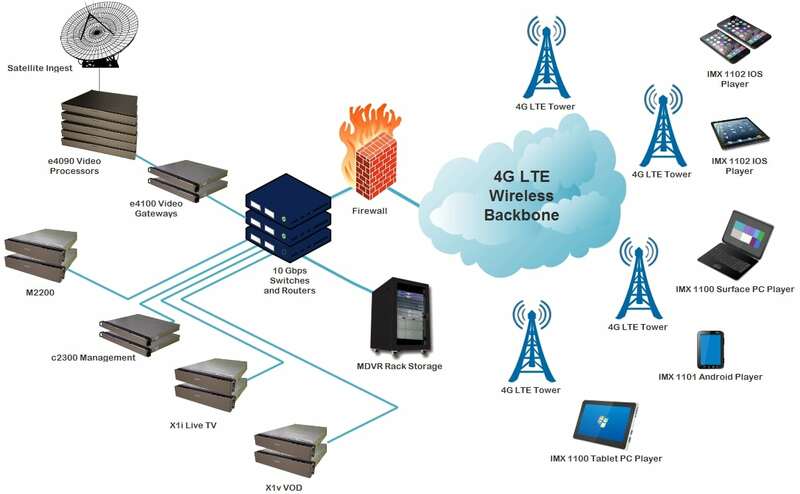 However, typical IPTV solutions will not fully maximize network capacity and user connectivity and therefore will not support the highest-quality video across many coverage areas. You also maintain a number of legacy billing, network access, user-authentication, monitoring and other systems which must be integrated with your IPTV or OTT platform. Matrixstream’s system does all of the above and you should think through the below factors which will determine your system needs. Platform Integration – Yes, we just mentioned this above, integration is far and away the most overlooked yet mission-critical aspect of IPTV and OTT service launches. Many operators hoping to launch IPTV or OTT streaming offerings focus almost entirely on equipment and software costs, licensing fees and warranties. Those needs are obviously fundamental to any service and costs must be controlled, but initial integration with all of your existing systems and end-user devices as well as availability for future, cost-effective development absolutely must be factored into any platform choice. Number of Video Subscribers – Carefully consider both your audience within the first six months and look beyond to your user base within 12-18 months. The MX solution is N+1 scalable and can expand with you, but just as with all of your strategic purchases, It’s best to size your IPTV or OTT platform for near-term growth. Video Quality – Consider the bitrates your network will realistically support and which end-user connections and devices will sustain. Our excellent compression will allow you to sustain incredible stream quality, but even the largest mobile providers often limit users to perhaps 600kbps and emerging market operators may offer video at 200-500kbps. Size of Live TV Lineup and/or VOD Library: Many new operators see competitors offering literally hundreds of channels and/or enormous VOD catalogs. The MX platform can support an unlimited number of channels and VOD titles. However, you need to determine your ideal offering as every channel must be ingested, processed and streamed and all VOD and network DVR titles must be uploaded, processed, stored and delivered. Private Network or Open Internet: Consumers increasingly demand exceptional quality of service and do not care about your delivery constraints. Fast-channel changing, low latency, little buffering, quick EPG navigation and app performance are mission critical. The MX system will make the most of your network infrastructure whether you choose to deliver privately, blend private network and Internet delivery or stream entirely over the open Internet. That said, be sure to take connectivity into account as you plan video quality, lineup and library size, edge equipment needs and related factors. Device Mix – Mobile phones? Tablets? PCs and Macs? HD TVs? Set-top boxes? Be sure to order sufficient processing capacity to deliver at various bitrates with adaptive capabilities. The MX system delivers content based on connectivity as well as individual devices. Expandable – Be sure to consider scalability across all equipment as many platform can add streaming equipment easily, but storage capacity, database upgrades and other hardware and software critical to growth could require months to implement. The good news is that because we create and control the entire system end-to-end, you will have flexibility across your entire Matrixstream IPTV OTT platform. Software/firmware updates – Frontline support and truck roll is expensive and burdensome and customers unhappy in the meantime often take to social media to broadcast their frustrations. You need a platform that includes hands-free, remote monitoring, device renewal and software/firmware updates. We take that weight off of your shoulders and help you quickly restore quality of service and experience. Concurrent and Peak Audience – Estimating simultaneous viewers and audience spikes is just as critical as the overall registered user capacity. Many of the most popular pay TV and OTT platforms allow for multiple concurrent viewers and perhaps as many as 5-10 authenticated devices per-account and consumers in many territories now expect this access from any video service. Be sure that your platform will support what you believe to be a typical simultaneous audience as well as peak viewership during major events and broadcasts. A good rule of thumb may be 20-30% of your user base watching at any given time and perhaps 35-40% during heavy usage.